The holy Yeshivah Tomchei Temimim is one of the largest Yeshivos in the world, both in size and in stature. However, its nature and character as a Chabad Yeshivah make it unique among all other Yeshivos: [to use a metaphor,] the orchard is special, the trees are special, and the one who planted it and cares for it is special. 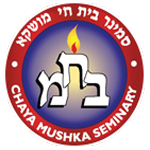 Tomchei Temimim is not merely an academy for study and teaching; it is also a training facility, where Jewish youth are trained in Torah and Avodah, so that Torah study and fulfillment of the Mitzvos may be done with relish and inner vitality, and not merely by rote.